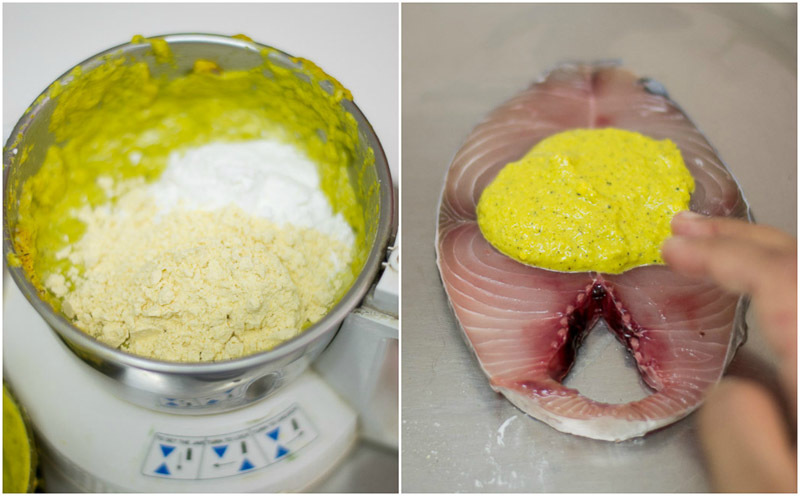 Recipe for South Indian style Fish fry made with spicy coconut masala paste. Recipe with step by step pictures. 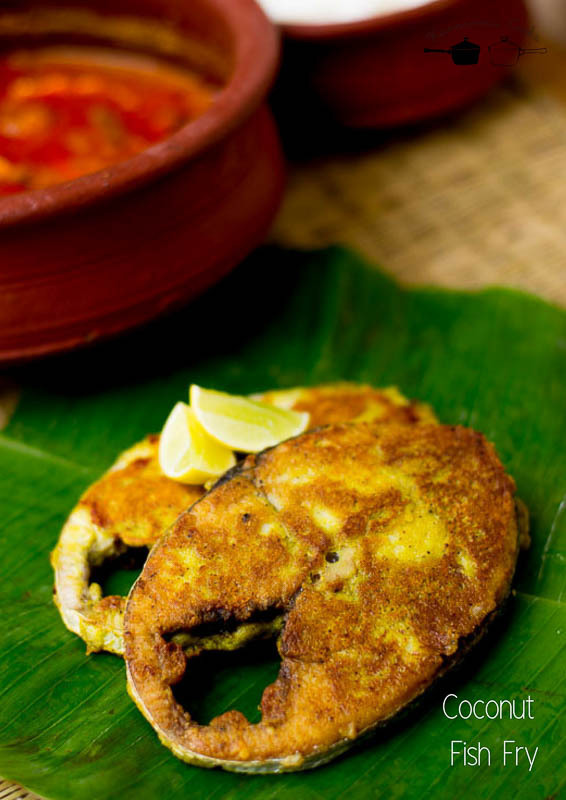 This recipe for coconut fish fry is a winner. 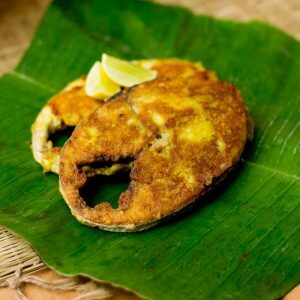 The flavor of the coconut and green chilli really makes this dish very different from the usual south Indian fish fry that is dominated by red chilli powder. Do try it at home and I am sure you all will like it! Grind these ingredients in a small mixie using few tablespoons of water – Fresh shredded coconut, shallots (small onions), garlic, ginger, green chillies, curry leaves, turmeric powder, black pepper and salt. Do not add too much water while grinding as the masala will become watery. 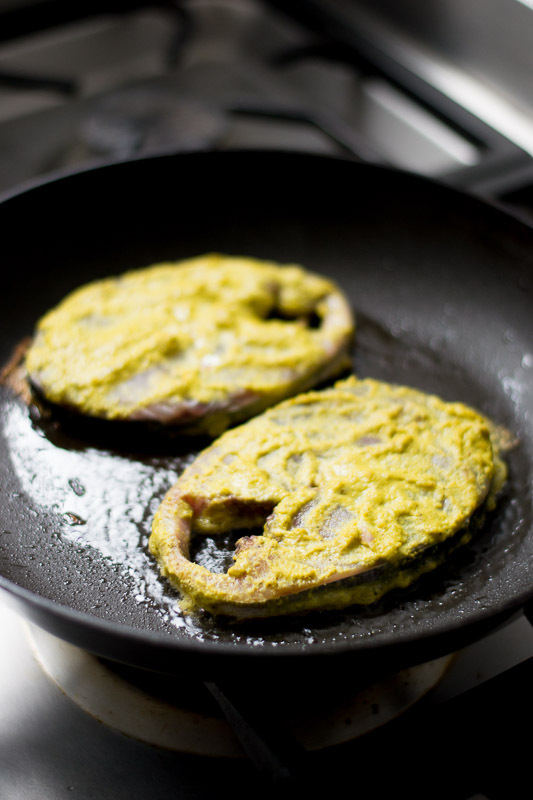 Add in a tablespoon each of chickpea flour (besan) and rice flour to the ground masala and mix well. Set aside. 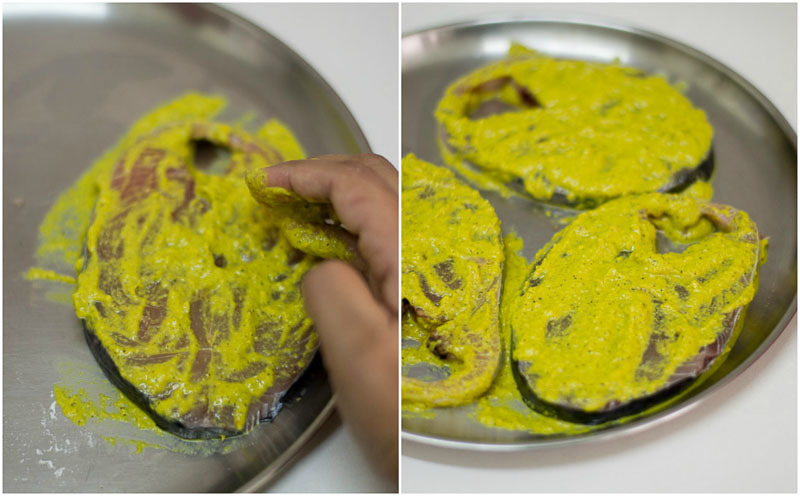 Apply the masala generously on the fish steaks. Let the fish steaks marinate for 20 minutes. Heat oil in a pan for until very hot. 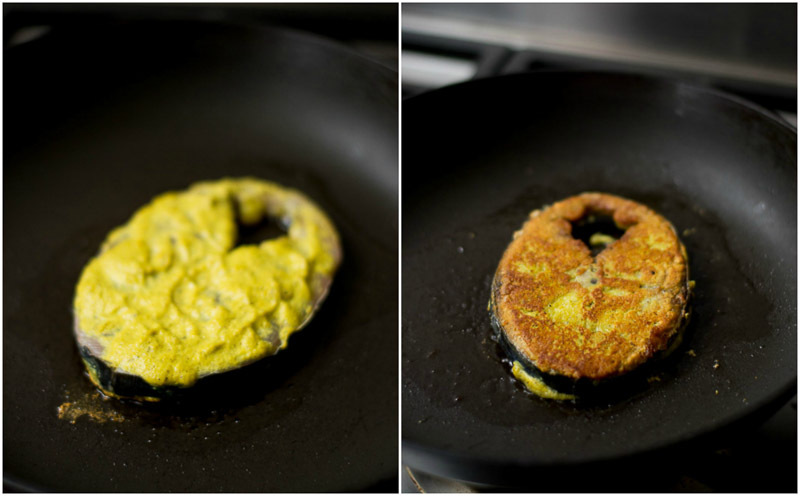 The marinade for Coconut Fish Fry will not leave the fish if fried in hot oil. That’s the trick. Shallow fry the fish for 1.5 – 2 minutes on each side in really hot oil. 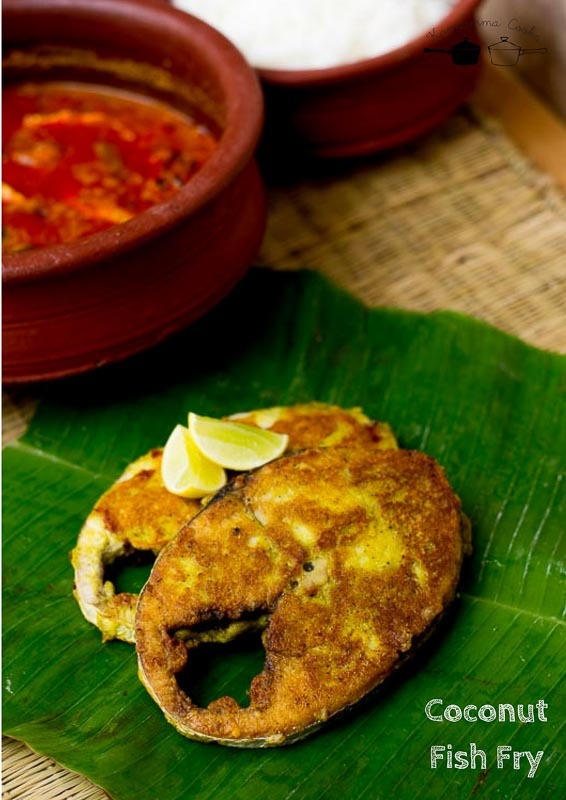 Drain the fried fish on a paper towel and serve the Coconut Fish Fry hot! 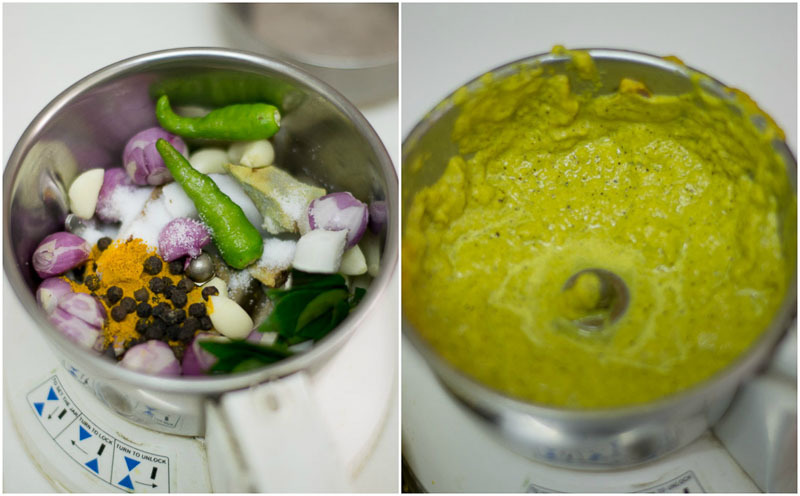 Grind the ingredients listed under masala to a fine paste. Add a few tablespoons of water while grinding. Heat oil in a pan for until very hot. Tried this recipe Kannamma. The taste was heavenly.